5.1 Earthquake hits Seram, Indonesia. 5.0 Earthquake hits Catamarca, Argentina. Invest 92 is an area of disturbed weather in the North Atlantic that has the potential for further tropical development. Invest 91E is an area of disturbed weather in the East Pacific that has the potential for further tropical development. Germany – Four people died and several more were injured in the southern Germany state of Baden-Württemberg after violent storms with torrential rains caused severe flooding. The floods also caused substantial property damage. Mass bleaching has killed more than a third of the coral in the northern and central parts of Australia’s Great Barrier Reef, though corals to the south have escaped with little damage, scientists said on Monday. Researchers who conducted months of aerial and underwater surveys of the 2,300-kilometre (1,400-mile) reef off Australia’s east coast found that around 35 percent of the coral in the northern and central sections of the reef are dead or dying, said Terry Hughes, director of the ARC Centre of Excellence for Coral Reef Studies at James Cook University in Queensland state. And some parts of the reef had lost more than half of the coral to bleaching. The extent of the damage, which has occurred in just the past couple of months, has serious implications, Hughes said. Though bleached corals that haven’t died can recover if the water temperature drops, older corals take longer to bounce back and likely won’t have a chance to recover before the next bleaching event occurs, he said. Coral that has died is gone for good, which affects other creatures that rely on it for food and shelter. 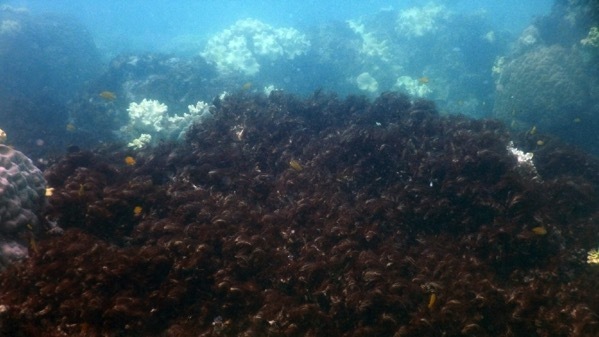 The damage is part of a massive bleaching event that has been impacting reefs around the world for the past two years. Experts say the bleaching has been triggered by global warming and El Nino, a warming of parts of the Pacific Ocean that changes weather worldwide. Hot water puts stress on coral, causing it to turn white and become vulnerable to disease. Other reefs have suffered even more severely from the recent bleaching; Some Pacific islands, for example, have reported coral death rates of more than 80 percent. This April, 2016 photo released Monday, May 30, 2016 shows mature stag-horn coral dead and overgrown by algae at Lizard Island, Great Barrier Reef. Tropical Depression Bonnie is located about 30 mi…50 km ENE of Charleston South Carolina and about 60 mi…95 km SW of Myrtle Beach South Carolina with maximum sustained winds…30 mph…45 km/h. Present movement…NE or 40 degrees at 3 mph…6 km/h. Bonnie hit the Carolinas on Sunday and did not leave much damage in its wake, although drenching the Carolina coastal areas. Bonnie has since been downgraded to a tropical depression. Bromo (East Java, Indonesia): The activity of the volcano remains low. Sporadic, relatively weak ash emissions continue to occur from time to time and a weak glow is visible sometimes at night. 7.2 Earthquake hits the South Sandwich Islands. 5.2 Earthquake hits northern Algeria. 5.1 Earthquake hits western Australia. 5.0 Earthquake hits East Timor. 5.0 Earthquake hits western Australia. Tropical Storm Bonnie is located about 60 mi…95 km se of Charleston South Carolina and about 115 mi…185 km SSW of Myrtle Beach South Carolina with maximum sustained winds…40 mph…65 km/h. Present movement…N or 360 degrees at 8 mph…13 km/h. A Tropical Storm Warning is in effect for east of Edisto Beach to Little River Inlet South Carolina. Lightning Strikes – Eight children and three adults were struck by lightning Saturday in a Paris park after a sudden spring storm sent a bolt crashing down upon a children’s birthday party. Another group of people at a children’s soccer match in western Germany were also hit by lightning Saturday afternoon, leaving three adults seriously injured. 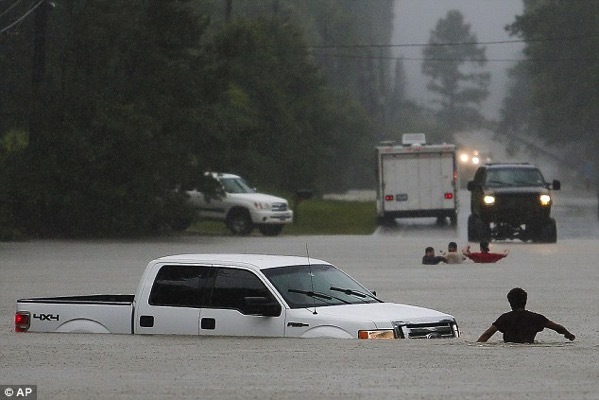 Texas, USA – Torrential rain over the past weeks in Texas and Kansas have left at least four people dead and five others missing. The threat of severe weather has now lessened in Texas but more flooding could happen as rivers and waterways keep rising slowly. Other parts of the US got drenched Friday, including Kansas, and a tropical depression in the Atlantic Ocean brought rain and wind to the coast of South Carolina on Saturday. A disfiguring tropical disease that had been contained to Syria has now spread across the Middle East as millions are displaced from the war-torn region. Cutaneous leishmaniasis is a parasitic disease spread by bites from infected sand flies. It can lead to severe scarring, often on the face, and regularly goes undiagnosed and untreated. The disease had been contained to Syria, particularly to regions under ISIS control such as Raqqa, Deir al-Zour and Hasakah. The civil war has devastated the country’s medical facilities, seen thousands of health workers killed and hospitals destroyed. Along with the chronic lack of water and bombed out buildings, this created a ripe breeding ground for the sand flies and allowed the disease to thrive. It had previously been claimed by the Kurdish Red Crescent that the spread of the disease had also been caused by ISIS dumping rotting corpses on the streets. As more than four million Syrians have fled the region, the disease has now moved into its neighbouring countries of Turkey, Lebanon, and Jordan. The death toll from cholera in Mandera has risen to 13 after two more people died yesterday. 89 patients are still admitted at the county’s referral hospital. “There is a massive outbreak of the disease in the town. We are receiving patients in the final stages of the disease making it difficult to manage them.” according to Medecins sans Frontieres. The outbreak was confirmed on April 29th after severe cases of diarrhoea were reported in Mandera town. At the same time, an outbreak of the mosquito-borne disease, Chikungunya is placing further pressure on already stretched health services in the county. Over 500 patients have been admitted in public hospitals. 5.5 Earthquake hits southeast of the Ryukyu Islands off Japan. Tropical Depression Two is located about 265 mi…430 km SE of Charleston South Carolina and about 280 mi…455 km SSE of Cape Fear North Carolina with maximum sustained winds…35 mph…55 km/h. Present movement…NW or 315 degrees at 14 mph…22 km/h. 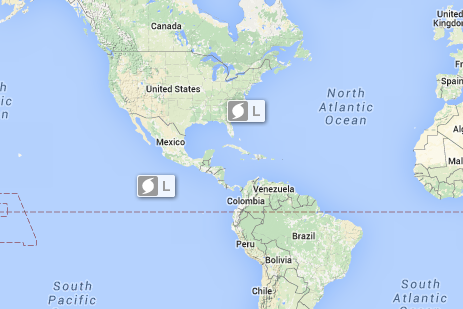 A tropical storm warning is in effect of South Carolina from the Savannah River to Little River Inlet. The 2,400-acre Juniper Fire near Young is being managed to actually benefit the ecosystem. Other lightning-caused fires being monitored in the region include the 2,170-acre Cowboy Fire eight miles south of Flagstaff just off Interstate 17, the 1,200-acre Mormon Fire six miles east of Munds Park and the 1,000-acre Pivot Fire eight miles northeast of Strawberry. Fire conditions are high to extreme in northeastern Alberta. The Fort McMurray wildfire remains out of control. It is estimated to cover 576,781 hectares in Alberta and about 3,200 hectares in Saskatchewan. As of 7 a.m., there were 20 active wildfires in Alberta, with one out of control. The fire in the Peace River area is now under control. There are 2,309 firefighters, 104 helicopters, 261 pieces of heavy equipment and 24 air tankers currently battling the fires across Alberta. With higher humidity in the forecast and the potential for showers, it is expected that firefighting conditions will improve through the weekend. Around 2.8 million people in three Central American countries need food aid after two consecutive years of severe drought decimated crops and exacerbated hunger among the poor, the U.N. Food and Agriculture Organization (FAO) said. Prolonged dry spells since mid-2014, linked to the El Niño weather phenomenon, have battered subsistence farmers in Central America’s “dry corridor” running through Guatemala, El Salvador and Honduras. Poor rainfall has left parched, cracked soil, fields of withered maize and bean crops, and empty water wells in these areas. Some 3.5 million people are struggling to feed themselves in Guatemala, El Salvador and Honduras, and of that number 2.8 million rely on food aid to survive, the FAO said. Some 400 farmers have killed themselves so far this year in the parched Marathwada region, which is home to about 19 million people. It’s located in the otherwise prosperous Maharashtra state, a central Indian region devastated by two successive failed monsoons and a crippling drought. The dry wells, shrivelled stubble of sugarcane fields and withered fruit trees across the region reflect the suffering of hundreds of millions of Indians across at least a dozen other states that are under the grips of a severe drought. Monsoon showers, which normally run from June to September, are crucial in a country where 60 percent of the population works in agriculture and less than half the farmland is irrigated. For the average farmer, who lives and earns from season to season, a poor monsoon means food must be carefully rationed because he has little money to spend. Small farmers have been pushed into poverty. Poor farm labourers, hired by middlemen to work on large farms, have been forced to work for little or no money. Cattle farmers forced to bring their herds close to water supplies live in lean-tos and cook over open fires. In every village in the region there are several locked and abandoned homes. Tens of thousands of people have been forced to abandon their villages and head to slums in bigger cities to earn a living. Between August 2015 and 17 May 2016, WHO has been notified of 273 cases of Lassa fever, including 149 deaths in Nigeria. Of these, 165 cases and 89 deaths have been confirmed through laboratory testing (CFR: 53.9%). The cases were reported from 23 states in Nigeria. 5.8 Earthquake hits the Ryukyu Islands off Japan. 5.2 Earthquake hits central Peru. 5.0 Earthquake hits the Timor Sea.